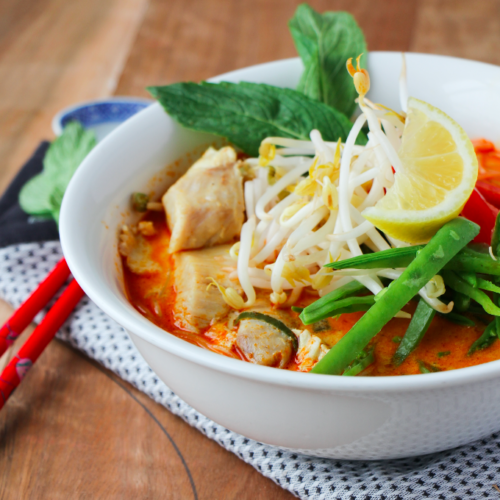 Curried Fish Laksa? Heaven in a bowl. A slurpy- splash-orange-coloured sauce-down your white top, eaten in an enthusiastic ardour. Yes this is our kind of soup! This dish is that good that it makes you look at your friends bowl to see if they have any left that you could steal. It’s also on the table in less than half an hour using only one pan! How wonderful? At Hart & Soul, we are always looking for new adventures. For that one, we have partnered with Dinner Twist, a genius service that deliver a box of fresh, local and top quality produce with a matching recipe book straight to your door for quick and healthy dinner. It’s easy, they plan, they shop, they deliver and you cook. Using our Laksa kit as a base, they have developed a delicious Fish Curry The result is a tasty, beautifully complete aromatic dish. Boil the kettle. Stick noodles from Laksa Kits in a bowl, cover with hot water. In the meantime, put fried lemongrass and chili in a separate bowl, cover with 2 cups of hot water. Place Laksa paste and coconut milk from laksa kits in a saucepan along with 1 cup of water. Simmer, covered for 10 minutes. Cut the fish into 4cm chunks, add to Laksa. Simmer for 4-5 minutes or until cooked through. Strain lemongrass infused water into laksa broth. Season to taste with fish sauce if desired. Divide noodles between bowls, top with fish Laksa and the fresh vegetables at the table and serve with lemon wedges.